When a Metal genre is expansive due to the great amount of bands releasing albums in the style, the best approach for bands with experience is to search for something different, because if they don’t do so, the flood of bands can confuse and distort the ideas of potential fans. But even good bands can do works that aren’t worthy of their names. 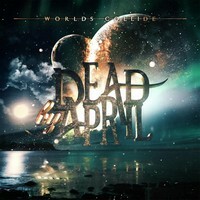 “Worlds Collide”, the new album from the Swedish quartet DEAD BY APRIL, is different, and the band shows that they aren’t here to be devoured by the trend. What they are doing different from the other bands from the style? Well, their musical formula of Metalcore is conventional, but they looked for a more accessible format, to reach a broader public. Of course you’ll hear grunts and aggressive modern moments, and a very good technique in each musical instrument. But it seems that they moved their focus from guitars to the keyboards, the melodies are easier to assimilate than in a greater part of the bands from the same genre. But it turns their musical work even more tasteful. To be honest, they seem to be exploring a New Metal influence of their musical work. Pontus Hjelm (guitarist of the band) took the duty of the production, having Ben Grosse and Paul Pavao on the mixing (done on The Mix Room, Los Angeles, USA), and Henke on the mastering. The sound quality of “Worlds Collide” is really amazing; clean, heavy and aggressive at the same time. It’s really excellent! Maybe the musical accessibility that we hear comes easily, due the work of Ben, because he worked previously with DISTURBED, MARILYN MANSON and SLIPKNOT. The album has some special guests, as the singer Tommy Körberg doing the lead voices on “For Every Step”, the additional vocals on “Crying Over You”, “My Heart is Crushable” and “Our Worlds Collide” done by Nils-Petter Nilsson, Christopher Kristensen, Manolis Papadopoulos, and Andréa. On these songs, you have a children’s choir as well. The finest moments of the album: the tender melodies in the middle of their brutality “Crying Over You” (very good vocals, both on clean and harsh tunes), the amazing catchy and accessible melodic lines of “I Can’t Breathe” (accessible and really tender, with very good guitars) and “Playing With Fire” (this one is more aggressive, with thundering rhythmic lines from bass guitar and drums, but with a hypnotic chorus), the very good accessible clean moments of “My Heart is Crushable” (very good chorus, indeed, along with fine lead clean vocals), an almost Metalcore ballad that we can hear on “Our Worlds Collide” (it’s almost Pop/New Metal song, showing that they really want to reach a broader public, and the high adrenaline moments come from bass and drums works), the touching harmonies of “This is My Life” (lovely keyboards and very good chorus once more), and the excellent “For Every Step”. It’s a lovely album, and DEAD BY APRIL will really conquer a broader public with it! 7. Can You See the Red?